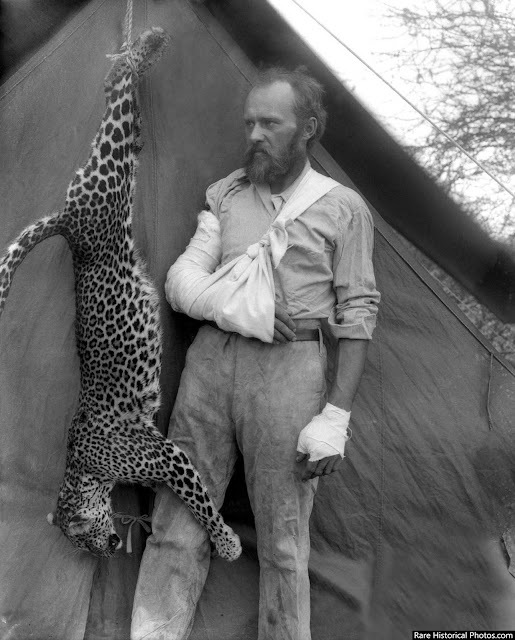 Carl Akeley with the leopard that nearly killed him, 1896. Carl Akeley, considered the father of modern taxidermy, was not only a taxidermist, but also a naturalist, sculptor, writer and inventor. Best known for the Hall of African Mammals that bears his name at the American Museum of Natural History in New York, Akeley revolutionized the field of taxidermy by developing a method of reconstructing the animal from the inside out. In 1896 Akeley started his first trip in Africa and it was also on this trip that Akeley came face to face with a deadly 80-pound leopard. During a journey to Somaliland, Akeley and his assistant were out hunting ostriches for the Field Museum in Chicago when the hunter spotted something lurking in the tall grass. As this was his first big trip, Akeley was a bit inexperienced and thought the mystery creature was a warthog. Wanting to bag “the hog” and take him back to the States, Akeley raised his rifle and squeezed the trigger. But when he heard a bloodcurdling shriek, he realized his mistake. This was no pig. It was a leopard—and it was still alive. Terrified out of his mind, Akeley pulled the trigger a fourth time, only to realize that he was out of bullets. Downright desperate, Akeley tried to flee, loading cartridges into his rifle as he ran. Working the bolt, he turned to shoot, only to see the leopard flying through the air, fangs bared. Fortunately, Akeley’s first shot had wounded one of the cat’s back paws. Thanks to the bullet, the leopard’s jump was a bit off, giving Akeley enough time to throw up his hands. The cat sank its jaws into the man’s forearm, and the two started wrestling back and forth, fighting for their lives. Eventually, the man and cat grew weak and tumbled to the ground. Finally, he managed to strangle the leopard with his left hand while ramming his right arm down the leopard’s throat. Later Akeley posed with the dead leopard, resulting in his most iconic photo.